PLATINUM CRYPTO MANIA 2018! ARE YOU READY TO PROFIT FROM IT! I hope all of you are doing well and that you are in good health. Last year was just the beginning of the crypto Boom and today we are about to showcase to you how 2018 will change the world of Trading forever. Personally, I am an advocate of scepticism but and did not believe in Bitcoin till 2014 and thereafter I took a serious liking to a market that seemed like it had no choice but to grow. Cryptocurrencies are a phenomenal opportunity which, as a trader or investor, you won’t see twice in a lifetime. Never has a market shown such possibilities to make profits, Bitcoin alone this year has climbed 1432.95%, which isn’t the biggest gains seen in the markets by far. 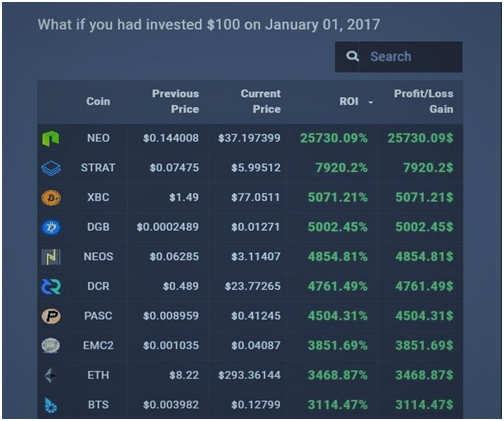 Typically, across the whole Cryptocurrency market, you can see over 100% returns each week on many coins. There are a number of sides to Cryptocurrency. You can trade and invest in Cryptocurrencies. You can use Cryptos to purchase goods or services worldwide. You can invest in some mining hardware and begin mining coins. There are a lot of individuals who are completely new to crypto currencies and have not got a clue on how to get started and that’s where we come in to cut out all the jargon and make you successful on your crypto Journey. 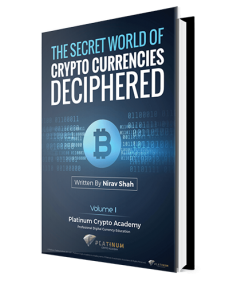 Today through this blog I want to give you a basic understanding of crypto currencies and then would like to invite you all to platinum crypto academy for a one to one session and discuss further how we can help you start making substantial gains from crypto currencies within 5 HOURS ! Who is this Consultation for? What will this Consultation cover? How will this benefit you? 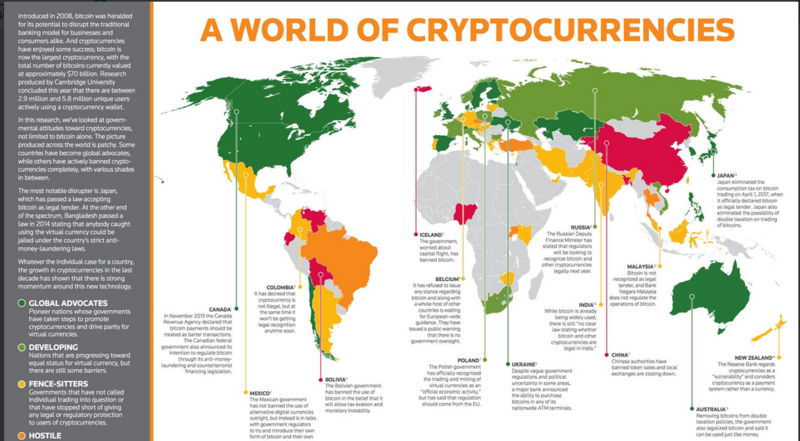 What banks have started to acknowledge Cryptocurrencies? When I say this, it may not come as a shock to you due to the scepticism is shown by the mass market towards the terms Bitcoin and Blockchain in the last 5 years the underlying solution provision has been forgotten. Its real potential only started to come to light in 2016 March. Back in 2010, the technology was slated by some of the largest financial institutions that today have accepted that this is actually the way forward and the belief has increased almost a 100-fold due to the benefits over the closed database systems. Blockchain the protocol that manages and facilitates the exchange of bitcoin has now become a transposable model of acceptance. Big financial players have begun to come forward by discussing experiments with the bitcoin blockchain and other decentralized ledgers. Below are just a few of the Largest Financial Intuitions that have accepted blockchain technology as a part of their development programme. Oliver Bussmann the CIO of UBS had written a publication post this event about benefits of adoption of blockchain technology which yet again gives us confidence about Institutional adoption. Being one of the Top 5 Banks in the world how can CITI Bank Be left out. CITI COIN as the name suggests has been under development since July 2015 and they have been exploring and built three blockchains of its own. Citi had submitted this request via a FOI which is a freedom of information request to the UK government to create its own currency coin. There are some very big rumours this year of announcements of phase one of release so watch this space. If you are involved in the financial sector, then sure you would recognise that French bank BNP Paribas is now in the process of setting up a cryptocurrency fund and is going to also be adding Bitcoin to its existing currency funds according to the Financial Times. Barclays in January 2017 started making a big move into the blockchain technology and was one of the most secretive players that came to the forefront early last year. The bank signed off on a proof-of-concept following an agreement with Safello, a Sweden-based bitcoin exchange. The experimental phase is over as reported by Usamaya Fayyad who has been praising the blockchain publicly over the last year now the bank has revealed plans of trialling bitcoin over the coming months. Last year in December 2017 Goldman Sachs has started creating a trading desk specifically for cryptocurrencies and this was reported on Bloomberg live. At Platinum, Our Crypto Analysts have been speculating this for a month and it has finally come to the forefront and we can just imagine the swings that will come with Goldman now taking this major step as several hedge funds will follow suit. With all the media talking about cryptocurrencies almost every single day it is impossible that you have not heard of Ethereum. Ethereum is the internet Version 2.0. Imagine a world without servers. A 100% open source platform to build and distribute a decentralized application. Vitalik the Creator of Ethereum learnt that there are so many more advantages of blockchain and that it can be used for something greater than just sending and accepting the currency. Ethereum was built to be a world computer” incorporating a virtual machine (EVM), a Turing-complete language (Solidity, Viper), a token (ETH), and fuel (gas). So Platinum Subscribers when you hear the word ethereum all you need to remember is the symbol above ETH i.e. Ether this is what you are buying and selling and this is the underlying token currency for the Ethereum platform. Ether has gone up almost 2000% over the last year and is set to carry on its bullish run. Now that you know the code what is Ether used for and where can it be bought. Ether is just like bitcoin can be bought from most of the major Exchanges such as Bittrex, Poloniex, Kraken, Coinbase, Gdax etc. Just like bitcoin computers are set up to solve questions on blocks of a blockchain and one the solution is provided the remuneration is in Ether. The aim is to build a method to the decentralise the internet. What is the reason to build a decentralized system? Let me put this in layman’s terms so when you actually buy your first ether token you understand what you are buying or investing in. Why would you need a decentralised system well below is a simple example. Say that John had all his important documents on a website called file drop and you can access this site anywhere and upload your files from anywhere. If the site goes down or says the server goes down then you can no longer access your important documents, although there we will be backup of data on different servers it would take time and there is always a chance of failure. So, a decentralized system is one where there is no single point of failure. This has many obvious advantages and you need to keep that in mind when considering investing in Ethereum. Ripple was released into the market space in 2012 and guess what it went up nearly 35,500%. What a crazy ride it has been for this currency and for 2018 it does not seem like this is going to stop. At Platinum, our crypto Analysts are expecting this fast money transfer network to carry gaining momentum over the next 5 years. Let us explain why but first of all let’s understand what the ripple coin actually is. 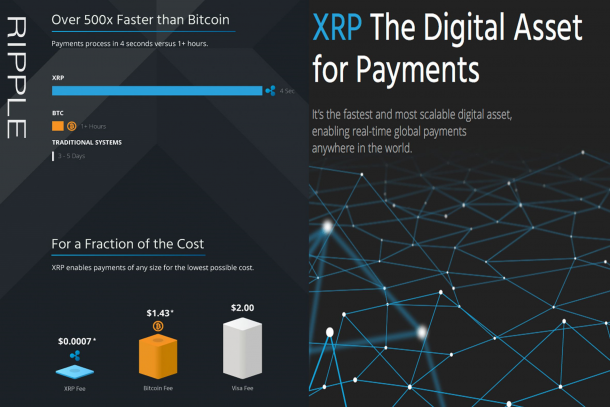 Ripple technology has been accepted by more than a 100 banks and the numbers are only going up day by day. Take a look at this live Video of the CEO OF Ripple and you can judge the rest. The goal of Ripple is to be a global settlement network, a platform to allow anyone to transfer money in any currency to any currency in a matter of seconds. This is an ambitious goal meant to eliminate the use of older systems like the Western Union or SWIFT. Below is the symbol that you need to look for when you would like to buy this on an exchange. If you have any questions about buying and selling or investing Ripple please feel free to talk to one of our crypto Analysts live. So, what is so special about Ripple that it has gone up over 35000%? LEARN HOW TO BUY RIPPLE AND START MAKING PROFITS TODAY! Consider this scenario: Tracy and John need to send some money to each other. Tracy uses Canadian dollars (CAD) to conduct her business, while John operates in Japan (JPY). While it might not be evident to end users, the process behind Tracy sending John money involves converting the CAD to a common currency like USD, then transferring the money between Tracy’s bank and John’s. Finally, the USD in John’s bank is converted back to JPY. This incurs a lot of fees at every exchange and wastes a lot of time. The Ripple network and currency aim to fix this problem. The Ripple platform and coin being accepted by banks gives the process legitimacy and, at least from an investor’s standpoint can be a little more reassuring. This is not the case with bitcoin and other currencies as they are seen as competition by the banks. ARE YOU READY TO BECOME A CRYPTONARIRE IN 2018? LEARN HOW TO MAKE MONEY FROM CRYPTO TRADING TODAY! 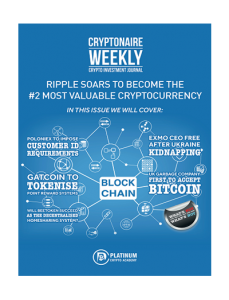 From our Crypto Trading Guide to our industry-leading weekly Cryptonaire Magazine, The Platinum Crypto Academy provides all the information necessary to ensure you are a consistent and profitable trader! I hope you enjoyed our special Crypto blog for 2018 and I wish you all the best of luck for the year ahead.